Originally uploaded by kimmilster's paradise. 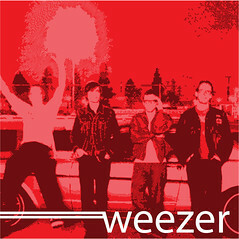 Weezer’s latest release, self-titled but known as The Red Album, has a song that is possibly every grown man’s reflection: “Everybody Get Dangerous.” Rivers (with whom I share a birthday) sings through a list of the absurd risks and violence he and his friends wreaked out in their childhood. I hear variations on the same kind of risk and destruction my mates and I carried out as kids: “blow up mail boxes/With a baseball bat… throw rotten eggs into traffic/Toilet paper the fences… Hockey games on frozen ponds/No safety pads were ever put on/Drivin' home on country roads/Sixty-five in a twenty-five zone.” If not the actual word-for-word, then some variation was played out by nearly every guy I know. In essence, boys being boys and no matter how many regulations and metaphorical bubble wrap our current culture attempts to cover over boys, the risk, the smashing things up, is inevitable. Like so many grown boys, Rivers wonders: “There must be/A guardian angel/Or some kind of destiny we have/‘Cos we should have died/A long time ago/The way that we were livin' in our paths.” A thought I’ve considered numerous times the older I get, considering all the nutso things we did, some legal and some questionably illegal. Again, I’ve heard this refrain from the ranks of most men. My guess is every boy is given a certain amount of grace that keeps his consequences from ever fully catching him completely. I wonder what the answer would be? If it is the chorus - ”Everybody Get Dangerous” - then mothers across the land will rise up in protest… and yet, it might just be what the men of our country need. Unfortunately, I’ve known too many men who take this as permission to re-live the foolishness of their boyhood, sacrificing their marriages, and their own children in the process. I am not talking about jumping off a cliff, or out of a plane – thought I’ve done both – but something more along the lines of translating the risk we carried out as boys into risk that the world needs from us as men. And there are books a plenty suggesting the same, I am simply glad that Weezer has joined the ranks.